At the Second Coming, there will be a great resurrection. Multitudes will be raised from the dust (Daniel 12:2-3). Those who have lived in rebellion against God and His law, will hear judgment pronounced against them. They will be left to die in the plagues. Their bodies will be consumed in the fire which will “burn up” the earth. The redeemed will go with Christ to the place which He has prepared, in the Father’s House. For a thousand years, they will prepare to serve as priests under Christ. They will be healed from the effects of living in the war zone we call this life. The earth will lay desolate and uninhabited during this millennium, except for Satan and his angels who will be confined here. At the end of the 7th (sabbath) millennium, Israel redeemed with Christ their King, will return to the earth. They will restore the waste places and rebuild the ruined cities. They will raise up a city on Mt. Zion, and a Temple - the Temple seen by Ezekiel the prophet. The healing river will flow out from this Temple, and the earth will come back to life - animals and fish and birds - and people. Those raised to continue their lives at the start of this 8th millennium will be those who were not called of God during the first age. They will be those who because of immaturity, or disability, or circumstance, could not make an informed choice for the LORD. It is only right and just that these people have the opportunity to choose. It is also right and just that they must choose, either to serve the LORD or to rebel against Him. Every human being must fulfill the same requirements - for citizenship in the family of God - belief resulting in obedience based upon love and respect. Before they can choose, these people must HEAR and UNDERSTAND the truths of God. Many of those raised at The 8th Day will come up to Mount Zion, and will give their allegiance to Christ as Savior, LORD and King. They will learn “His ways,” and they will choose to “walk in His paths.” Christ will even taken some of these people for priests, to help govern, and for Levites to work in support of the Temple (Isa. 66:21). NOTE: The “sons of Zadok” were priests, loyal to King David when Absalom rebelled (2 Sam 15, Eze. 44:15, Eze. 48:11). They are a type of those priests, who will be loyal to King Yeshua Messiah, when Satan leads a rebellion. NOTE: If you just clicked on this chapter because you were looking for information about the Gog-Magog Battle, you might want to read some of the studies/chapters which led up to this one. Click HERE to go to the page where all the studies/chapters of “The 8th Day” are listed. You will see that this Gog-Magog chapter/study is one of the final chapters. If the fate of all mankind was decided at the Second Coming, then why allow Satan to “deceive” once again? Very simply, there are many individuals who have not yet made a decision either for or against Christ as LORD. The “rest of the dead” - those who are raised at the 8th millennium have yet to make this choice. Satan demands the right to test each one. God’s justice requires that all be tested. Their motives must be made manifest by their actions. (This is because they will finally be judged by their actions.) It follows then, that the multitudes - raised to life following the 7th millennium - have not yet been tested. They must learn of Christ and “His ways,” and then they must choose - to serve Him, or to rebel. Let me just remind you once more: This battle takes place during the 8th millennium! This is NOT a final battle, prior to the return of Christ in glory. Revelation 20:7-9 “Now when the thousand years have expired, Satan will be released from his prison and will go out to deceive the nations which are in the four corners of the earth, Gog and Magog, to gather them together to battle. We must remember that this is prophecy, and it may include symbolism. Those peoples, tribes and leaders who were ancient enemies of God’s people, may simply represent the enemies of the LORD in this account of a future battle. Gog is a strong leader - controlled by Satan. The LORD says that He will pull Gog towards this battle in a way that he cannot resist. But God always assumes responsibility for what He allows Satan to do. We suggest the study: “The Wrath of God - A Different View”. Ezekiel 38:2-6 [A vision] “Human being, turn your face toward Gog (of the land of Magog), chief prince of Meshekh and Tuval; and prophesy against him. Say that Adonai ELOHIM says, 'I am against you, Gog, chief prince of Meshekh and Tuval. I will turn you around, put hooks in your jaws and bring you out with all your army, horses and horsemen, all completely equipped, a great horde with breastplates and shields, all wielding swords. Ezekiel 38:14-16 “Therefore, human being, prophesy! Tell Gog that Adonai ELOHIM says this: ‘Won't you be aware of it when my people Isra'el are living in security? You will choose just that time to come from your place in the far reaches of the north, you and many peoples with you, all of them on horseback, a huge horde, a mighty army [Magog]; and you will invade my people Isra'el like a cloud covering the land. NOTE: The LORD said the same of Pharoah and the Egyptians (Exo. 7:5, Exo. 10:1-2, Exo. 14:4). By means of My victory over you (Gog), I will be recognized as the Only One. More than once, the LORD so terrified and confused enemy troops, that they fought against each other. The battle of Gideon against the Midianites is one such account (Judges 7:22). Fire will rain down upon lands distant from Israel and the main battle site. Every rebel will be destroyed. Just as in the story of Korah, Dathan and Abiram (who lead a rebellion against Moses) - though distant from the main confrontation, all of those rebellious in heart were destroyed. Read the story in Numbers Chapter 16. Jesus quoted from this passage. See Mark 9:44, 46 & 48. NOTE: The “fire” of God kills the rebellious, but it does not char or consume the bodies. This explains why the survivors are described – burying the bodies. This explains why the bodies (at the Second Coming) are left unburied (Jer. 25:33). There will be noone left to bury them. This explains why the bodies of Nadab and Abihu were carried out of the courtyard, by their tunics (Lev. 10:5). All these were consumed by the “fire” of God. The glory of God is “fire,” but not fire in our earthly sense. Many believe that the current nation of Israel is the fulfillment of the promised “return to the land”. They see the nation as if “resurrected” - like “dry bones” come back to life (Ezekiel 37). I believe that Satan will use these circumstances, to deceive “the very elect.” Before the return of Christ, a terrible attack will threaten to destroy Jerusalem (probably involving Muslim nations, along with Russia and perhaps others). A miracle will “save” Jerusalem. Many will call this the Battle of Gog and Magog. Many are teaching that the Battle of Gog & Magog will take place prior to the Second Coming. I do NOT agree! There is only one Battle of Gog & Magog, and it will clearly be fought AFTER the 7th millennium (Rev. 20:7-10). In Scripture we find this battle only in Revelation 20 and in Ezekiel Chapters 38 - 39. John is writing about the same event which Ezekiel saw. Ezekiel just provides much greater detail. The Battle of Gog & Magog is NOT the Battle of Armageddon. The Battle for Armageddon (Mount of the Congregation) DOES take place just at (or just before) the Second Coming. See Revelation 16:16. Growing up, I was taught that only the wicked would be raised after the 7th millennium. They would be raised to face judgment and then execution. I just don’t believe this any longer. If “multitudes of those who sleep in the dust” are raised “to shame and everlasting contempt” at the Second Coming (Dan. 12:2-3), if they are then “cut off” from the people of God, and are left to die in the last plagues - isn’t that execution enough? They die, fully aware that they are lost - that their death will be eternal. Why resurrect these same people - a thousand years later - to do it all over again? Please see the study “Judgment Day”. The future return of Israel to the land is called a greater “exodus” (Jer. 16:14-21 & 23:3-8). We should look to the first Exodus to understand the dynamics. At the first exodus - Israel was accompanied by ANOTHER group of people. During the wandering, those of the Mixed Multitude were educated in the things of God. In the wilderness, one LAW applied to both. By the end of the journey, these people had been incorporated into Israel, or they had died in the wilderness. At the FUTURE EXODUS, “the nations” will be taught the ways of Yahweh. Some will serve Christ as LORD and King. Others will rebel against Him (just as the first mixed multitude rebelled in the wilderness). Those who choose to serve God, will be circumcised (in heart and in flesh) by LORD Yeshua. They will receive immortal spiritual bodies. Those who choose rebellion, will die at the Battle of Gog-Magog. In my studies of the enemies of Israel, I discovered that only the “captives of Egypt” are promised they will be gathered and returned to their land (Eze. 29:13-15). Why only the “captives of Egypt?” Why not all the captives of Babylon, or Assyria or Rome? I believe it is BECAUSE the original “mixed multitude” were “captives of Egypt.” These were people of mixed race who left Egypt, WITH the Israelites, following Moses into the wilderness. They stood at the foot of Mt. Sinai. They were taught the Law of Yahweh! NOTE: Jeremiah, in his “judgment on the nations” calls them “all the mixed multitude” (Jer. 25:15-17). Did you know that there was also a “mixed multitude” at “the return” of Jews to the land, in the time of Ezra and Nehemiah? (Neh. 13:3). Very interesting! History repeats. The Gog-Magog battle is a rebellion. During The 8th Day (8th millennium) those raised last will be taught of Yahweh and of His law (just as the original mixed multitude heard the Ten Commandments.) They will no longer be ignorant or uninformed. Many will enter into covenant with God thrrough Christ. In the TYPE, Caleb - a man of great faith - was one of the original mixed multitude. He was a “Kenezite,” meaning a descendant of Kenaz, a son of Esau (Num. 32:12; Josh 14:6,14; Gen. 36:8-11). Others - multitudes - like the sand of the sea (Revelation 20:8) will resent the reign of Christ. They will be deceived (by Satan) into thinking they can overthrow the rulership of Christ, and they will come up to attack Jerusalem, where Christ sits as King. God will then defend His city. Fire will come down from heaven and will consume them. The clean-up will take seven months (for the bodies) and seven years (for all the weapons). 1. At the second coming: The earth will be burned up - and the wicked along with it. 2. At the Gog-Magog battle: The rebellious will be consumed by “fire” from heaven. In the first two events -- living people are destroyed -- on the earth. 1. 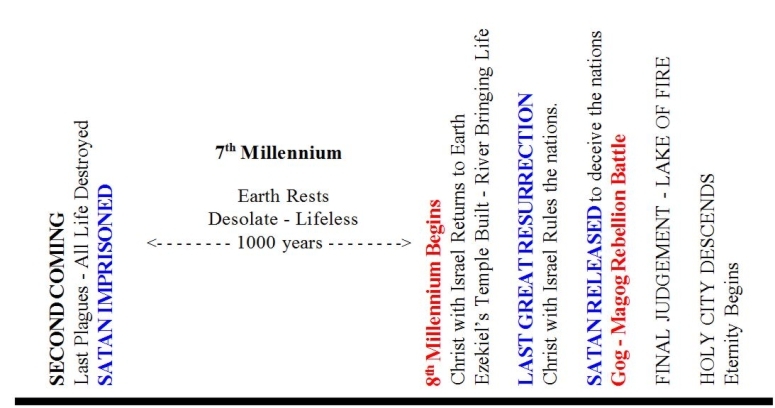 At the 8th millennium, a last great resurrection will take place. 2. All of those who lived in ignorance of God and His Law will be raised. 3. They will be governed by Christ and His “kingdom of priests”. 4. Many from these nations will come to know the LORD and His ways. They will choose to serve Christ as their King. 5. Most from these nations will rebel against the reign of Christ. 6. They will follow a leader named Gog - a great war chief. 8. Fire will come down from God out of heaven, and will consume them. This “fire” will consume all of the rebellious, including those who remain at some distance from the battle site. 9. Cleanup of the bones will take seven months. Bones will be buried at a city, set aside for that purpose.